I’d seen pictures of the futuristic hot-rod. I’m no gear-head, but the Slingshot just looks like a wild ride. And I’m so old I know how to drive a stick-shift. It was a churlish morning, somber gray with low-hanging rainclouds in my neighborhood of Nuuanu. Typically for Hawaii weather, by the time I arrived in Hawaii Kai to meet with Bruce the skies had cleared. Two shiny, new Polaris Slingshots sat gleaming in the sunshine, seemingly waiting to be fired up. The Slingshot is slung low to the ground, and looks like a video-game cyborg creature ready to pounce. I couldn’t wait to get behind the wheel. Old synapses switched on as I remembered the feel of a clutch and gear-shift on a test run around the block. I hadn’t driven a standard transmission in at least 15 years, but the Slingshot is easy to operate and quite user friendly. No problem. Yaling hopped into the copilot seat, we put our safety helmets on and we followed Bruce and a videographer over the hill to the rugged Ka Iwi coastline for a shoot. The unique two-wheels up front/one in back configuration handles beautifully. It has the tight suspension of a rally car, and the pickup of a racing motorcycle. The Slingshot seems to want to wind it up. The acceleration is exhilarating, and Yaling and I were both hooting like teenagers as we zipped along Kalanianaole Highway enjoying the sunshine and salty smell of sea spray in the quickening trade-wind breeze. Bruce explained kindly that yes, they were indeed rentals, and that he and Yaling owned the company that offers the rentals. 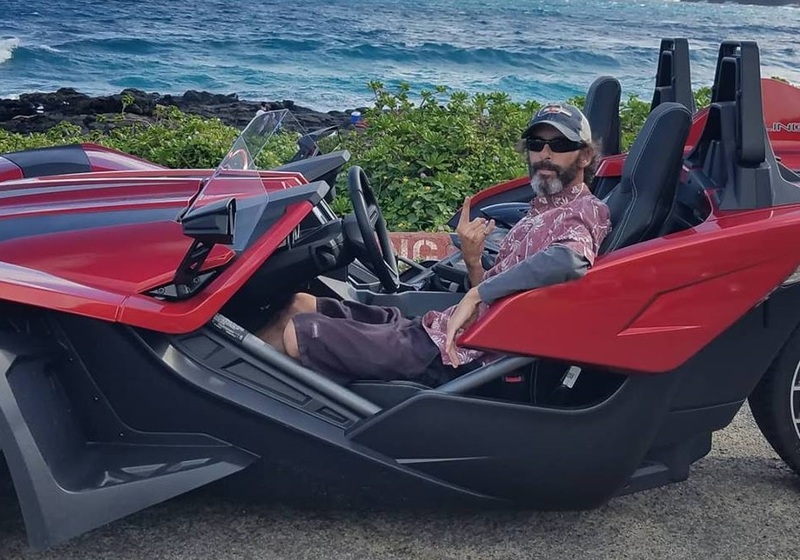 Always the people-person, Bruce beamed a broad smile as tourists slipped into the seats and flashed shaka signs for an impromptu photo shoot. Yaling and I stood by, commenting on the attention the Slingshot attracts. 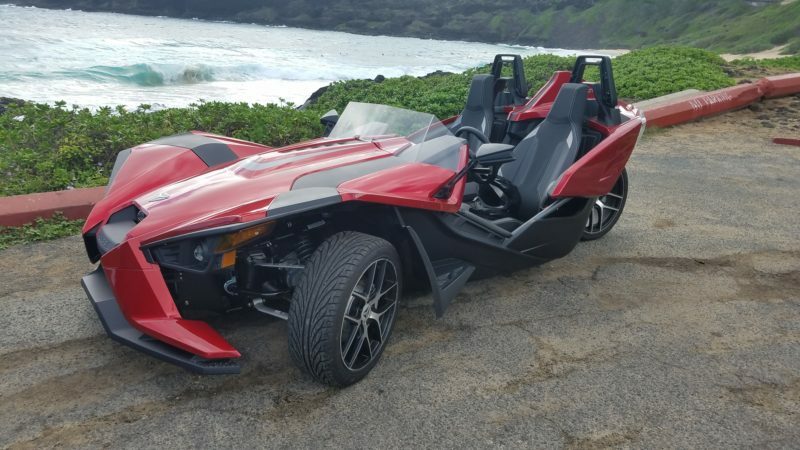 The Polaris Slingshot at Makapuu Beach. A savvy European tour operator sidled up to Bruce and asked a few questions about the vehicles and rental options. Bruce let him know that guided tours, and half- and full-day rentals are available. Before long, Bruce was happily do an on-the-spot, on-camera interview about the Slingshots for the European tour operator. I’m certain they were still talking about the other-worldly vehicles in the parking lot as we sped off. It was much the same at the Lanai Lookout. I lucked into a parking spot, and as soon as I turned off the engine two gentlemen with thick southern accents approached. “Y’all renting those things? Whaddya call ’em?” Anyone not whale-watching was captivated. At the Halona Blowhole (also known as “From Here to Eternity Beach”), folks surrounded us, giggling and snapping photos. A uniformed police officer patrolling the busy parking lot eyed us suspiciously before shrugging and turning to a group of numbskulls ignoring posted warning signs. It seems even a seasoned veteran of HPD couldn’t believe what he was seeing. Aloha Bruce and a Friend talk Slingshot. We wrapped up the shoot, having made new friends and sparked the imagination of everyone we encountered. I was still buzzing with excitement as we parked our respective Slingshot hotrods “back at the ranch”. I must admit that it was anti-climactic climbing back into my comparatively boring 4-door sedan for the drive back into town. Hardly. The Polaris is easy to drive, and is certainly the most thrilling vehicle I have ever driven on Hawaii roads. 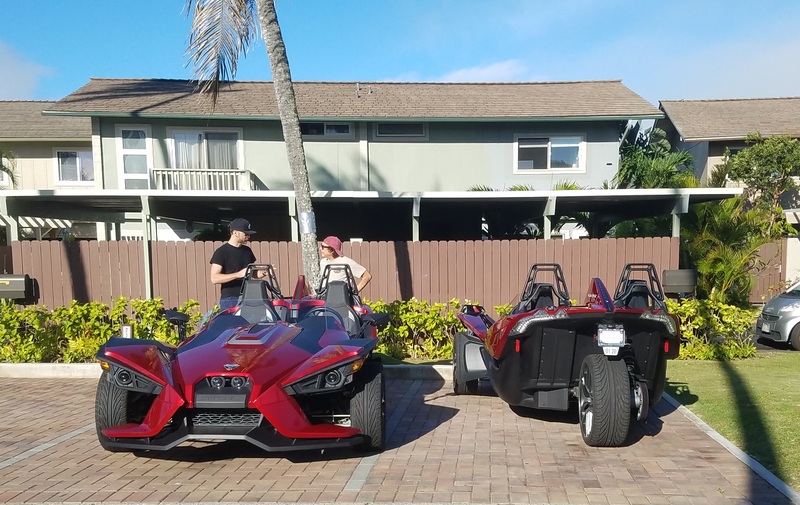 Blogger Jamie Winpenny in the Polaris Slingshot at Makapuu Beach.